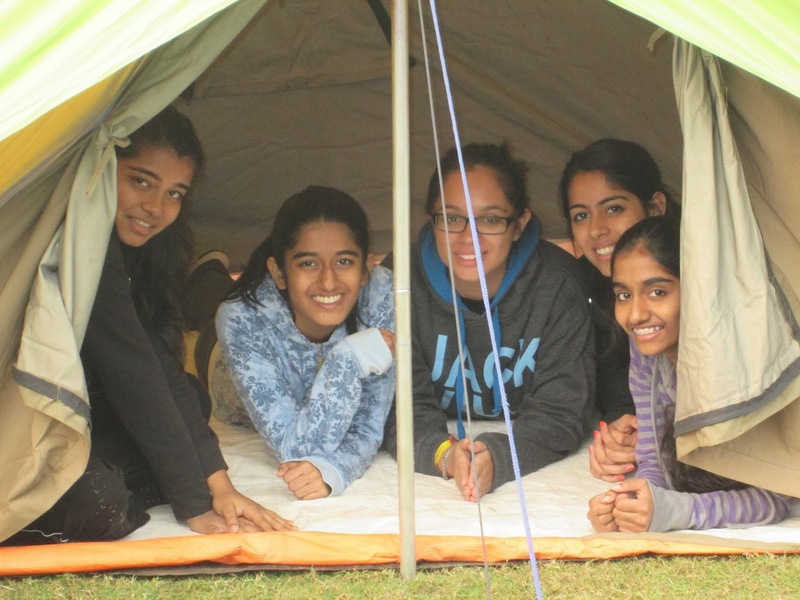 The Bronze aspirants of Ecole Globale International Girls' School, ventured on a fifteen kilometer trek that led them deep into the heart of the village Horrawala - a place amply endowed with greenery and scenic beauty. The month of November it was, but in the Garhwal Hills, the sun was shining bright. One after the other you could see girls shedding their extra baggage - their cardigans and jackets! To the first-timers, the walk was long and tedious, for the veterans, very energizing! Tall, stately sal trees contributed to the picturesque landscape and there were monkeys in droves! It was great to see them swinging on the branches, some with their little babies clinging to them as they moved like trapeze artists in a circus. As we reached into our bags, we were warned by the instructor not to feed the monkeys. Suddenly, we stood transfixed! What was that strange creature standing poised before us? A huge iguana, its scaly back gleaming in the sunlight, looked curiously at the lot of us. We looked on in wonder. It was our very first encounter with this giant lizard -- like beauty that is a native of these parts. Once it had inspected each one of us properly, the iguana lost interest, and disappeared into the bushes. Whew! That was amazing. We moved on squealing in excitement to see the many other such beings of the wild. A mongoose here, a wild fowl there. What an adventure! The most looked-forward-to part about the trek was, of course, the mid-way-snack that was prepared by the girls themselves. Sandwiches were wolfed down followed by refreshing glassfulls of fruit juice and the girls were already running high on adrenalin, waiting to hit the track again. Sixteen students and six adults from RS schools in eight different countries assembled in New Delhi in early July. In the short time available to us in Delhi, excursions were arranged to landmarks such as India Gate and a little last minute shopping was done at Khan Market and Connaught Place. Very early on the morning of July 10, the group left Indira Gandhi International Airport on the Jet Airways flight to Leh. We spent one night in the Hotel Omasila and two nights in the Ladakh Residency, the establishment owned by Tsering Wangchuk, the founder of Snow Leopard Trails. During this acclimatization period, we walked the colorful streets of the town, hiked up to a spectacular Stupa and took a daylong car trip west, along the Indus, to Likir Monastery and the Zanskar River. Following this brief and luxurious interlude, we headed east to our new home, the village of Thiksey. Our campsite lay in the shadow of the 1000 year old Gompa and the sounds and activities of the monastery were with us day and night for the duration of our stay. Our camp was simple but comfortable. The highlight was the cooking of our culinary magician, Sonam. The lowlight for many was the visit to the 'Thunderbox'! Washing from a bucket with cold water was both bracing and refreshing after a long hot day of work. The work of the project took place at the Lamdon Model School, close by our camp. We developed a love hate relationship with the thousands of eleven kilogram bricks of sun dried Indus River mud as we carted them around the building site. We mixed and transported thousands of kilograms of mud. We decorated the main hallway of the student hostel with creative and cheerful murals and re-painted the entrance sign. We also spent some time in the school classrooms engaging with the students. We worked alongside local men and women who did much of the skilled work and kept our spirits up with banter and work songs. At the end of our time, they paid us the enormous compliment of saying that we had worked harder than any other group they had ever seen! In the middle of the project, we took a day to visit the famously beautiful Pangong Lake on the Chinese border. Early in the morning of 25th October 2013, a group of 80 Award participants (17 Silver & 63 Bronze) reached Camp Wild, Dhauj. We barely has time to settle into our cottages/tents when we were divided into groups to start with the activities. First was the obstacle course followed by lunch and then we did rock climbing, rappelling and valley crossing, followed by a session of the obstacle course. The obstacle course was a fun task to teach us the distinctive ways in which the army trains. This involved: the jungle leap, Tarzan swing, commando net, Bermuda Bridge and much more. However, with all this fun we also had some serious activities to teach us vital survival skills like knot tying and tent pitching. It took a lot of effort and teamwork, since it was first time for most students, but we still managed to pitch a tent. The students learnt the different and vital ways to tie knots with a rope. This was the base for everything, even for putting up the tent. To us, learning the skill of tent pitching was the biggest take away from the camp. Tents are one of the most important camping materials, and without them, explorers would have to sleep without shelter on long treks. Pitching a tent is rather simple and can be done in 5 minutes. Step 1: Find a good camping spot; flat ground is essential as the tent may not stay up on uneven ground. Also sleeping on a slope is rather uncomfortable. Step 2: Lay down the ground sheet; this sheet protects the tent from the soil, rocks and also makes it more comfortable to sleep on. Step 3: Set up the ridge pole; this pole slides into a hook at the top of the tent, it eventually will become the backbone of the tent. Step 4: Attach the pegs to the main tent structure; they should not be too tight or loose, just enough to keep it upright. Step 5: Pull the ridge pole up so that you can attach the two dollies; these two rods attach to the frame on both sides of the tent and help keep it upright. Step 8: The guy ropes can now be attached. These ropes hold the flysheet steady and attach it to the main tent; they also steady the Dollies. There are many different kinds of tents but they all are set up more or less the same way. I know that with this skill in hand I can now travel on long expeditions and not have to worry about where I am going to sleep. Tents cannot be heated by anything electric or by fire as they are made out of nylon and that is very combustible, the only thing that can heat it is body heat. The two most commonly used tents are dome and A shaped; Dome shaped is used for long expeditions and A shaped for shorter ones. Tents were widely used by the Roman army -- which needed a place to stay for all its troops that was light and portable. The answer was the tent. People living in warm places usually live in tents made out of woven goat hair as nylon can catch fire in the extreme heat. Some camping tents are large enough to keep 10 people, extra camping gear and family pets; there is also room for 6 extra people! However this is nothing compared to the Khan Shatyr; this 150 by 200 meters tent is larger than 10 football fields and is an urban scale internal park. After attaining the Bronze Award in 2008, I decided to continue my Award Journey to accomplish a Gold Award. As part of my Residential Project, I decided to do something which would connect me to new people and unique surroundings. I heard about Thandge Gatsal Thangka Studio and School and was very keen to join it during my summer vacations. Thandge Gatsal painting studio and trust is located in Dharamshala, Himachal Pradesh, and is a registered trust with Government of India. 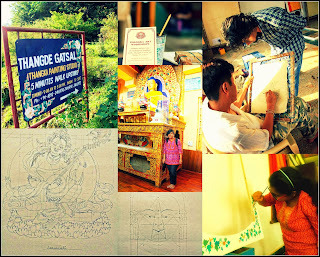 Thandge Gatsal strives to preserve the Himalayan Buddhist traditional art of Thangka Painting. The objective of the training provided at Thandge Gatsal is to support Thangka Painters through the preservation and dissemination of knowledge about Himalayan Buddhist cultural traditions. Thangka Painting is a unique Himalayan Art that originated in India and has attained classical levels in the Tibetan tradition. 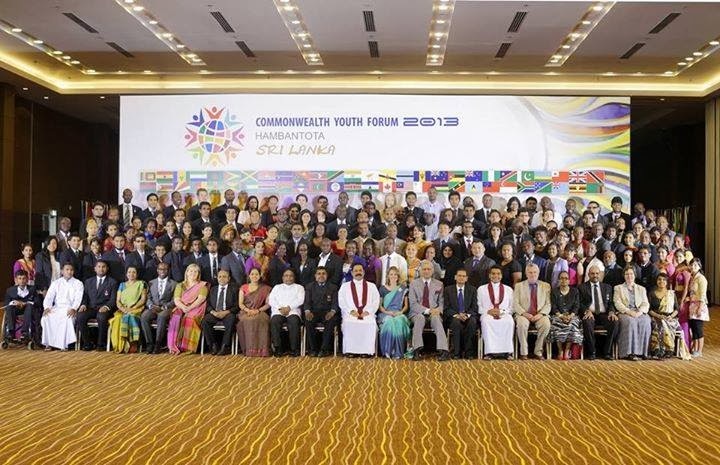 Being a part of our history and rich heritage, it must be preserved and promoted worldwide. Thandge Gatsal has been conducting training programmes to help develop an understanding about the iconography, methods and techniques involved in the process of creation of Thangka Art. A Thangka is more than a work of art; it is an object of devotion, an aid to spiritual practice, and a source of blessings to those who meditate upon it. I started my training at Thandge Gatsal from the 17th of June 2013. My training included an understanding of the drawings, iconography and the grids which are involved in the Himalayan Buddhist Art of Thangka Painting. Our classes started at 9 am in the morning and ended at 5 pm in the evening. Weekends were free. During the entire day all the students spent time practicing grids which were taught to us by Master Locho who is the founder of Thandge Gatsal Studio and School as well as a Master Thangka Painter. The students were taught in detail about the origin of this incredible Buddhist art during the evening classes. The theory classes as well as classes to clarify doubts were taken by Sarika Ma'am who is also a Master Thangka Painter. Ma'am ensured that all our doubts were clarified and that we practiced enough to reach perfection. It is unbelievable how everyone would enjoy every bit of time spend at the studio, sketching, learning grids and meditating upon the beautiful Buddhist chants. The evening time was usually free when the students of Thandge were allowed to go and explore the surroundings. Thandge Gatsal is situated in a small village, 4 kilometers away from the main city of Dharamshala. The evening walks included adventure walks in the dense forests, visiting some nearby villages, exploring the chilled streams and spending time with the co-students of Thandge Gatsal who came from diverse cultures and places. The painters at Thangde Gatsal were always very helpful and told us real life stories about Tibet and the life of TIbetan refugees in Dharamshala. I got to learn so much about Buddhism, Tibet and India's political relations, Buddhist Art and the life and work of His Holiness the 14th Dalai Lama. On weekends we visited some of the most important places in Dharamshala. Among them was Norbulinga Institute of Tibetan Culture, which is even today keeping the Tibetan culture and values alive. I even visited the Dalai Lama's temple on various occasions. The whole idea of these outings was to understand the Buddhist culture and get a glimpse of the various Thangka Paintings in and around Mc Leod Ganj as well as those in the monasteries. Four weeks of my training finally ended on 14th July 2013. This included not only the grids related to thangka but we were also taught how to make canvas. Making canvas was the most amazing process. This surely was the experience I will always treasure. I would never forget the small little things that I learnt from this training program. There surely are many things that I would miss, this includes washing my own utensils after all my meals, seeing snakes almost once a week, the bright stars shining in the sky, fireflies, huge spiders, the peace of Himalayas and the rich talented crowd around. I thank everyone at Thandge Gatsal for such a wonderful experience and the beautiful memories and IAYP for providing me with a platform for exploring new things. With the quest to unreveal the wilderness as Nancy Wynne Newhall has quoted, the 2nd batch of the Bronze and the Silver aspirants from Maria's Public School, Birkuchi, Narengi, with their two Award Leaders and a nature anchor from Eco Concept, set forth to unfold the mysteries of the wild in Mawlynnong, Meghalaya. A village that got its name "Mawlynnong" from the bowl shaped stones that surround the village and in which the villagers harvested rainwater. Interesting indeed!! Every aspirant was excited about the camp and the trek which were to follow over the next two days. The enchanting beauty of the Cherrapunjee hills welcomed us the very first day on our way to Mawlynnong. The adventure for the day started with the aspirants challenging themselves at the zip line at which every aspirant completed with absolute delight. Later on our trek continued to the most exotic and enchanting caves of Mawsmai. Exploring the caves from one end to the other with minds alert for the wild call of the bat, the eyes in constant look-out for the sharp tips of the calcite formations and wading through the pools of water creeping out of the crevices - the whole experience was mind blowing. Later that day disembarking from the vehicles we were welcomed by the enchanting beauty of the quiet village. After the participants settled down in their camps and the allotted cottages, the evening beckoned the night trail for 4 km with a little quiz set by our nature anchor which aroused the participants' interest and curiosity. The quiz was designed for the participants to be observant and alert about their surroundings. With many answers revealed, the participants' happiness knew no bounds and they eagerly awaited the trek for the next morning. The second day trek was challenging with firewood collections to be done by the students on their trail for the fire to cook the morning meal. This inspired the aspirants to be vigilant and observant throughout the trek and also helped them to develop a sound team spirit. After trudging and trailing the path for 10 km, a dip in the gurgling stream of the waterfalls was quite relaxing. The hike uphill to the base camp later was tough but it did not discourage the young minds and the night went well with gleeful singing and dancing around the campfire. The third day trek was to the living root bridge; this was one among the many living root bridges that the community of Mawlynnong treasure. Walking downhill for 8 km, the sight of the living root bridge mesmerized us. The root bridge was formed by the rubber plants being planted by the villagers on both sides of the stream and the roots of both the trees weaved together to form the bridge which helped them commute with ease. The Award aspirants were awestruck to find human beings at such remote area of our country living in so much harmony with nature. The living root bridge symbolised a living example of sustainable development.